Jeffry Flake has served as the junior United States Senator for Arizona since 2013. He is a Republican and represents the Sixth Congressional District of Arizona. In October 2017 he announced that he would not seek reelection in 2018. He served in the Judiciary Committee, the Energy and Natural Resources Committee, the Special Committee on Aging, and the Foreign Relations Committee, becoming chair of various subcommittees. 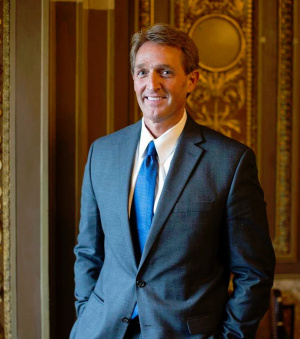 Flake was also one of the bi-partisan "Gang of Eight" that pushed through a Senate immigration-reform bill in 2013. He has been a vocal critic of US president Donald Trump. He has written a book that slams Trump (Conscience of a Conservative: A Rejection of Destructive Politics and a Return to Principle), he condemned Trump on the Senate floor, and he charged in a 2018 speech to the National Press Club that his party “might not deserve to lead” because of its blind loyalty to Trump. He was interviewed for the PBS Frontline program in an episode entitled "Trump's Takeover." Flake was elected to the United States House of Representatives in 2000, where he served for 12 years. In November 2006 Congressman Flake was profiled on 60 Minutes. Flake was born in Snowflake, Arizona (named in part for his great-great-grandfather, William J. Flake). After serving a Mormon mission in Zimbabwe and South Africa, Flake graduated from Brigham Young University, where he received a B.A. in international relations and an M.A. in political science. While at BYU, he met his wife, Cheryl. They live in Mesa with their five children. In 1987, Jeff started his career at a public affairs firm in Washington, D.C. Soon thereafter, Flake served as executive director of the Foundation for Democracy in Namibia, monitoring Namibia's independence process. In 1992, Jeff and his family moved back to Arizona where he was named executive director of the Goldwater Institute, a think tank and research organization. In this role, Jeff worked to promote a conservative philosophy of less government, more freedom, and individual responsibility. Flake Office Video of Jeff Flake fighting against earmarks. This page was last edited on 1 May 2018, at 18:53.